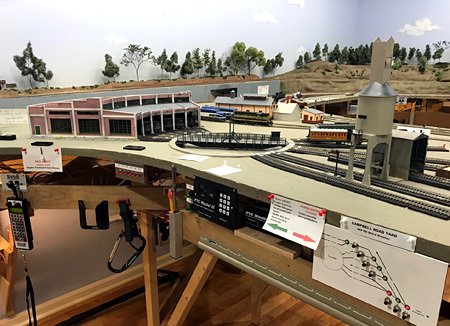 Denny Whitaker of Strongsville OH wanted to build a steel mill as the next phase of his basement layout. He planned for it to be on a peninsula and therefore had very tight geometry. He came to El Dorado Software for some Master Training time, as he was determined to make it fit. 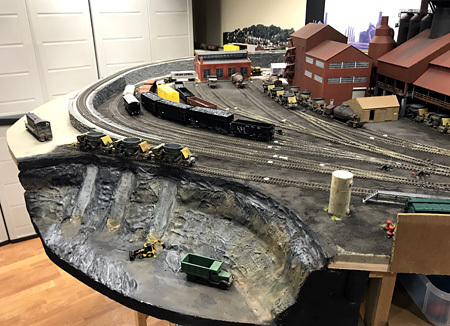 Denny didn’t want the steel mill to dominate the layout, but he wanted it to be complete with good operations. He ended up with the very nice design on the right. Then Denny shared his plan with his NMRA buddies - some of whom are steel mill aficionados. 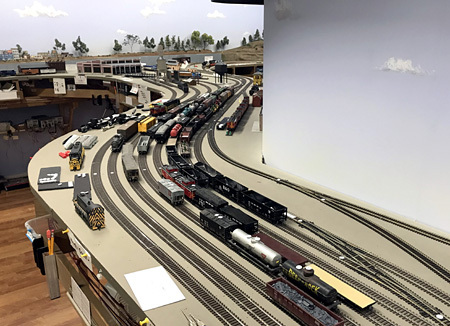 The group had all operated together on each other’s layouts, so they knew each other well - and even brought a few extra friends into the discussion. After a while the group convinced Denny that he should use a larger open area in his basement for the mill. 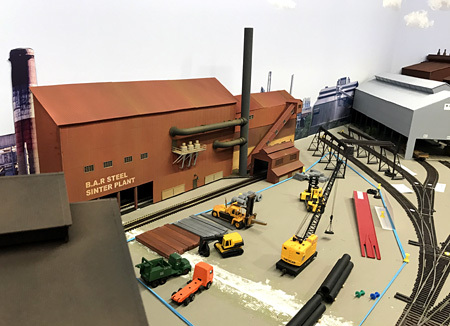 He would have a steel mill that would be more fun and realistic to operate, and include more details found in steel mills. Despite all his work, Denny went with their advice and decided to move the mill. When Denny called me to discuss his change in direction, he said “I’m 75 and I want to build this railroad while I can still enjoy it. Is there some way to make the design process go faster?” In fact, SoftTrak had been introduced recently. I showed him how it worked in an online session, and the smile in his voice was evident. 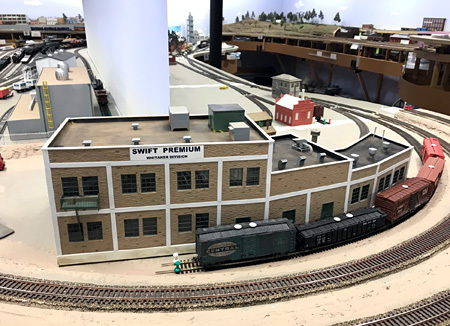 Denny was “tired of messing around with geometry when I just want to design a model railroad” - and that’s exactly what SoftTrak does. 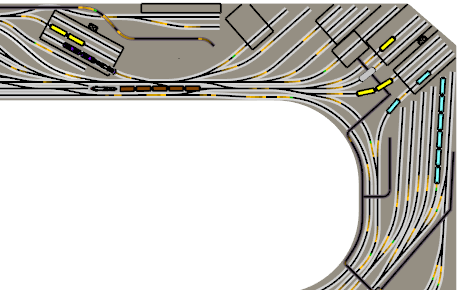 The image above shows one of the many useful applications of SoftTrak. The faintest image shows an S-curve in the route to the turnout. Is that desirable or necessary? Rotate and move the turnout slightly and the S-curve disappears, replaced by a smooth, large-radius curve. 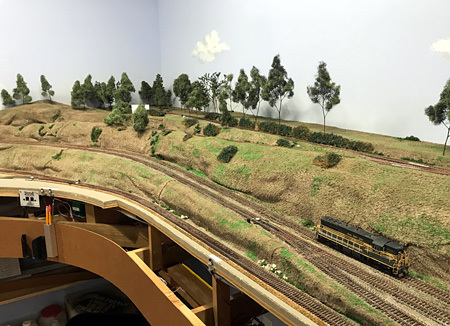 You might have a new design thought and try the turnout more in its original orientation but farther south - put the turnout where you want it, move the end of the SoftTrak, and see if it’s what you wanted. Two weeks after we talked, Denny sent me an updated plan. It was amazing to see - the mill was completely transformed in character and occupied perhaps three times more space. He used SoftTrak to connect turnouts to spurs or other turnouts everywhere, as seen on the right or at the top of the page. You pick the end points; SoftTrak does the geometry. Denny showed his new design to his supporters. It was met with congratulations and admiration, and some more feedback (of course). That’s what good friends are for! 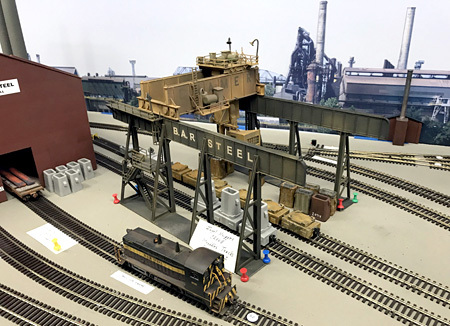 He incorporated their feedback and refined the design over a few weeks of “modify and review.” I like to say that Denny designed a steel mill in a month, but he points out that it was about 4 weeks at 40 hours a week over 10-12 calendar weeks. He and his friends then began building the steel mill. 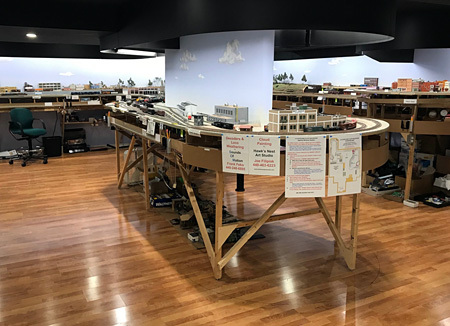 After about 18 months of construction, the layout had its first operating session in July, 2016. The group continues the work to complete the steel mill and enjoys op sessions together. How did Denny accomplish so much so quickly? Once you have a piece of SoftTrak on the layout, you can use Control+Select to drag’n’drop a copy of the SoftTrak somewhere nearby. Then connect its ends to turnouts or tangent track you have pre-positioned. 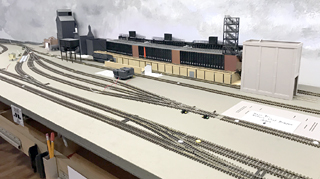 It’s easy to continue this process quickly, aligning buildings and spurs, nudging them a bit and reconnecting the SoftTrak. Design in “Color by Type” mode (Alt+Y) and you’ll see an accidental S-curve instantly. Every curve will meet minimum radius if it’s possible, easements are added automatically if you wish, and you’ll see a red radius warning when drawing or editing SoftTrak if it’s too small. SoftTrak changes the whole design paradigm! In a future article, we’ll see how multi-point SoftTrak lets you design a long main line quickly and precisely. Your flex-track designs can be far more interesting, thoughtful, and useful - in the mill, on the branches, and on the main. 3rd PlanIt is a mature product that’s been used for more than 20 years. It’s your best choice even for your first design, because you’ll always be designing more! Some customers have updated 3rd PlanIt over 15 years of evolving modeling. Think long-term. Think quality. Be inspired! In March 2014, as I was designing the expansion of my club-sized layout, I got many warning messages from 3rd PlanIt. I called Randy Pfeiffer, owner and designer of 3rd PlanIt. He listened to my complaints and asked me if I had tried the new SoftTrak tools that were already installed on my PC. I hadn't, so Randy suggested we hold an online meeting where we could chat on the phone while he watched my computer screen. He wanted to see exactly what my mouse movements and keystrokes were doing to my drawing. He then took a couple of minutes to take control of my computer and solve one of my dilemmas using SoftTrak. Bingo, the problem went away. On the spot, I asked him to tutor me for an hour on the use of SoftTrak. I love SoftTrak! I just move things around and hook them together - no more warning messages! I test all my changes by running virtual trains in 3D view with my operating session friends. Thus, I find and correct problems without creating sawdust or destroying expensive track and turnouts. I'm laying track right upon 8.5" x 11" letter size papers. The track alignment is perfect and the papers get pulled away as I build. 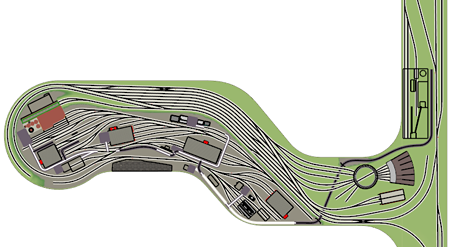 SoftTrak changed my whole thinking process and was key to designing a steel mill and layout I'm truly proud of! I hope everyone tries SoftTrak and sees how much easier it makes track planning.